Like many folks I play hooky from my work routine by ghost walking on “street view” in Google Maps, touring places I’ve been to or plan to see. So when I get the urge to revisit my father’s bookstore I can do what I’m doing as I write this: gazing at the Google Maps window neatly placed next to this open Word document on my desktop, considering all the information available to me about the single-story building at 9427 W. Pico Blvd. that used to house my father’s bookstore, located, if you’re curious, at 34º 03’ 19.26” N, 118º 23’ 41.25” W, elev. 59m. The ornamental wrought iron that fills in the decorative arches on the upper tier of the building’s façade is still there, though beneath them the new tenants, Pico Glatt Mart, have added what looks to be a home-made metal cart return and four green sun-shades over the display windows and entrance. Hanging from the shade facing Pico is a banner proclaiming “Shabbat Take Out Available Here.” The show window beneath, which used to feature new books, now features a sign assuring customers that the store is “Under Strict Supervision,” while folks more interested in value might be enticed by the banner on the shade over the entrance advertising “Lunch $4.99.” The photograph shows the sliding doors at the entrance wide open, but all I can see is the side of a Snapple display and the back end of a shopping cart peeking out where the children’s section used to be. 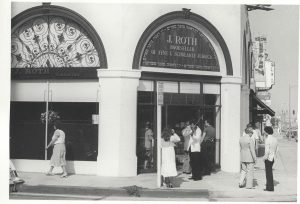 The grand opening of J. Roth’s Bookstore in 1979. My father remembers that he chose the location on Pico because it was fresh territory with clean streets and neat storefronts located at the farther, western edge of the neighborhood’s fast-growing Jewish population. It was free of the clutter and Jewish kitsch he associated with the aging Fairfax Ave. neighborhood, the previous center of Jewish retailing in L.A. To be sure, it was still a Jewish neighborhood; B’nai David-Judea Congregation, founded in 1948, anchored the center of Pico-Robertson at 8906 W. Pico, and Beth Jacob Congregation, located since 1954 on Olympic Blvd., defined the northern border between Pico-Robertson and Beverly Hills. Both were Orthodox synagogues. But the retail businesses had been mostly dry cleaners, upholstery stores, appliance repair shops, and sundry non-kosher restaurants. One of the oldest stores in the neighborhood was (and still is) Sonny Alexander Florist, established by New York cab driver Alexander Friedman in 1929 after the stock market crash convinced him to head west and start over at 9330 W. Pico. Jewish owned food shops like Beverlywood Bakery, established in 1946 at the corner of Pico and Oakhurst Dr., or Factor’s Famous Deli, opened in 1948 across the street from the 9427 building, or Label’s Table Delicatessen, which started in 1974 at 9226 W. Pico, had no kosher certifications and they catered mainly to non-observant Jews and to non-Jewish customers. A Map of Pico Blvd. View larger map in different window. My father in front of the bookstore. The arrival of J. Roth/Bookseller and Yeshiva University High School of Los Angeles, which also opened in 1979 even farther west on 9760 W. Pico Blvd., signaled a new phase in the neighborhood’s development. Young Israel of Century City soon opened up a block east of the bookstore catering to the young newcomers, affiliated with the burgeoning Orthodox revival, who wanted a separate and ritually stricter congregation than those at Beth Jacob and B’nai David-Judea. The Aish Center appeared shortly after at the corner of Pico and Doheny Dr., one of the outposts of Aish HaTorah, an Orthodox Jewish outreach organization serving ba’alei t’shuva, returnees to the faith, who were searching for “authentic” Judaism. And it wasn’t long before Chabad-Lubavitch showed up too at 8850 W. Pico, perhaps the most well known Hasidic sect in America because of their commitment to outreach and educational activities for Jews, especially young unaffiliated ones. The influx of all these new Orthodox organizations quickly reshaped the retailing environment; the neighborhood’s businesses became more identifiably Jewish, with restaurants proudly advertising their kosher certifications. It was a major moment, I remember, when Dunkin Donuts opened with bona fide rabbinic approval of their donuts’ kashrut. The excitement was only matched by the opening in 1985 of Milky Way, an upscale dairy restaurant owned by Steven Spielberg’s mother, Leah Adler. For a long while there were no other Jewish booksellers or Judaica shops on Pico. But beginning in the late 1980s and early 1990s those businesses started showing up and putting pressure on my father to carry more Orthodox and traditional Jewish materials. When he moved in 1990 to a new location on Olympic Blvd., a block down from Beth Jacob Congregation, he invited an Orthodox silver wholesaler and an Orthodox sofer, a scribe, to set up their shops within his store. It was not a successful arrangement. In less than a year, the sofer opened his own shop back on Pico Blvd., the 613 Mitzvah Store, which carried only “kosher” sforim and ritual goods. It’s still there. Soon there were other sforim stores and Judaica shops on Pico: Brenco Judaica, Ufaratsta Judaica Center, Nagila Gifts & Housewares, and Cadeau Gifts, Silver, Jewelry, Judaica. Today there’s even an outpost of one of the Fairfax Ave. Jewish bookshops doing business on Pico, Solomon’s Book Store. It’s as if the old map of Jewish L.A. that my father wanted to stretch westward had finally sprung forward into the present like some cultural slinky, all the places and people contracting into their familiar shapes, only now on Pico Blvd. It’s tempting, of course, to claim that not just a map but also a model of Jewish bookstore relocated to this new Jewish place. Here again were those smaller Jewish bookstores of New York’s Lower East Side, themselves modeled after the bookselling stores, stalls, and peddler’s carts ubiquitous in Eastern Europe. As a 1906 magazine article described it, these stores, “musty with the smell of books and soup” (“Jewish Bookstores” 21), featured in their show windows ritual items like prayer shawls, phylacteries, mezuzahs, kiddush cups, and Torah mantles, but in back stocked prayer books, Bibles, and works of halakhah (Jewish law) and responsa (legal rulings). They might also, depending on the owner’s tastes, carry Yiddish stories by Mendele Moykher-Sforim (Sholem Abramovitsh) or Jacob Dineson, plays by Jacob Gordin, or even Yiddish translations of Shakespeare and Tolstoy (“Jewish Bookstores” 22-23). But that would be a historically inaccurate and far too nostalgic a view. I think it’s more accurate to say that when places are relocated spatially and their past social and cultural arrangements relocated by the present too, the mix of the familiar and the novel that appears on the street reminds us not of models per se but of their social mobility and cultural changeability. Which is why Christopher Morley’s image of the bookstore in his novel Parnassus on Wheels and in his essay “Escaped Into Print” has always been so appealing to me. Whether a travelling book van or “the world’s first seafaring bookshop” (“Escaped” 62) aboard the R.M.S. Tuscania in 1922, the bookstore in Morley’s view is constantly in motion, helping to create “interlacing roots of association” (“Escaped” 64) between books, people, and places. J. Roth/Bookseller may no longer be a part of the Pico-Robertson neighborhood, but the Jewish bookstores that multiplied in its place attest to the various ways that the past still circulates in the present. Photos courtesy of Laurence Roth. “Jewish Bookstores of the Old East Side,” The Book Peddler: Newsletter of the National Yiddish Book Exchange 17 (summer 1992): 20-23. Morley, Christopher. Parnassus on Wheels. New York: Avon Books, 1983. ______. “Escaped Into Print,” in Ex Libris Carissimis. New York: A.S. Barnes, 1961.